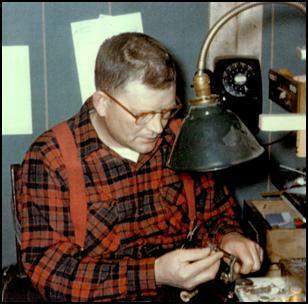 Clarence A. Roberts, born in 1916, in the small town of Onaway, Michigan, went on to become one of the most iconic fly tyers of Michigan lore. He passed away in 1984. It all started back in the late 1930s, when Clarence Roberts' older brother Cliff bought "the whole nine yards" of fly tying equipment from a Herters Catalog. When Cliff joined the Army Air Corp in 1942 he passed on all of his tying equipment to Clarence, who was a game warden in Grayling, Michigan. Clarence rapidly became good tyer and he loved it! 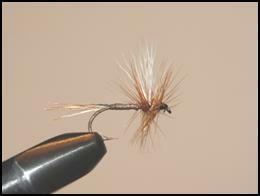 Clarence began commercially tying flies around 1949. He was very prolific, tying over 50 different patterns and was selling in excess of 5000 flies per year. He sold his flies to canoe liveries, sporting goods stores, gas stations, bait shops, hardware stores and 'mom and pop' shops. In his later years of tying he even sold out of his house. He raised his own roosters for hackle, and his job as a game warden provided him access to free road kill deer and other animal hairs and furs. Most, but not all, of the flies he tied incorporated deer hair. Clarence was a traditional Michigan tyer of the 50s and 60s who used mostly natural animal hair, fur and feathers. He did use some synthetics like chenille, wool, floss, and tinsel. He never dyed any materials, preferring the natural look. He did not, as a rule, tie smaller than a #14. He did not use a hair stacker nor did he ever use any dubbing. He did not wax or treat his thread; he felt it was a waste of time. He did however varnish the heads of his flies. He tied a whole spectrum of flies including dries, wets and streamers. 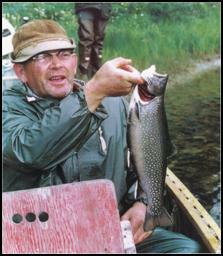 He also tied pan fish and ice fishing flies. His flies had the reputation of being very durable and productive. Most all of his original patterns were developed between 1952 and 1959. Other than his famous Roberts' Yellow Drake, none of his patterns are tied or sold commercially any more. The patterns I have listed below were originated by Clarence Roberts. The documentation for the flies comes from notes left to the family by Clarence and old published articles. Any flies that might be challenged historically or lack supportive evidence have been omitted from this article. Hook: Mustad #94840 Size: 10-12. Body: Deer Hair tied parallel to the hook shank, extended body style. Wing: White Deer Hair tied post. Tail: Deer Hair, extended from the body, clipped away leaving only a few strands for the tail. This fly was originated by Clarence, early in his career. He was tying and selling them in 1952. The fly was most likely tied for the Baetis hatches. The fly in this photograph was tied by Clarence Roberts. 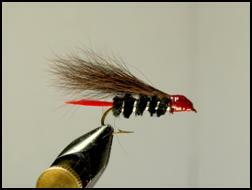 Wing: Badger Hackle Tips, tied semi-spent. Hook: Mustad #9672 2XL Size: 4-8. Wing: Brown Deer Hair, tied trude, extended beyond the bend of the hook to the end of the tail. Little information is available on this fly. The fly in this photograph was tied by Clarence Roberts. A variation of this fly, tied by Clarence, is on display at the DNR Ralph A. MacMullen Conference Center in Roscommon, Michigan. Hook: Mustad #94840 Size: 10-14. Tail: Ginger Hackle Fibers tied sparse. Wing: White Deer Hair, upright and divided, tied sparse and pulled forward. Little is known about this pattern. Family and friends can't remember anyone that Clarence knew named Bradley. It's a generalized searching pattern used anytime there are brownish spinners on the water. A sample of this pattern, tied by Clarence, is on display at the DNR Ralph A. MacMullen Conference Center, in Roscommon, Michigan. Hook: Mustad #94831 2XL Size: 4-6. Tail: Gray Goose Quill Fibers. Tied long and in a slight 'v'. Each of the two segments is made up of 3 fibers. Wing: White Hackle tips, paired and tied spent. 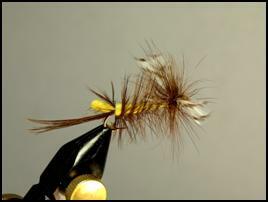 Body: Brown Hackle Fibers, palmered the full length of the body (including, in front of the wings). The rear half is clipped and tapered. Clarence also tied this in gray. The Gray Drake (clipped body) used Grizzly Hackle for the body and Grizzly for the wings. They were designed as night fishing flies. Samples of these patterns, tied by Clarence, are on display at the DNR, Ralph A. MacMullen Conference Center, in Roscommon, Michigan. He was commercially selling this fly as early as 1952. Body: Bleached Moose Hair, tied parallel to the hook shank, extended body style. Wing: Grizzly Hackle Tips, paired and tied spent. Tail: Moose Hair, extended from the body, clipped away leaving only a few strands for the tail. Most likely a generalized pattern that could be used any time there were light colored drakes or spinners on the water. The fly in this photograph was tied by Clarence Roberts. Hook: Mustad #94831 or #79580 Size: 8-10. Body: Light Green Chenille body with a loop (egg sac). Wing: Deer Hair tied down over the top of the body. Hackle: Brown & Grizzly, mixed. The fly in this photograph was tied by Clarence Roberts. He was selling them commercially as early as 1952. 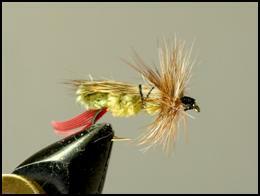 The fly was also tied with a yellow chenille body. Hook: Mustad #94840 Size: 8-14. Tail: Pheasant Tail Fibers, 3-4. 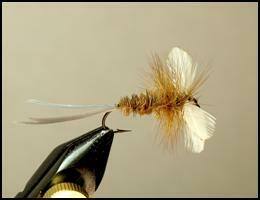 Wing: White Deer Belly Hair, tied post. 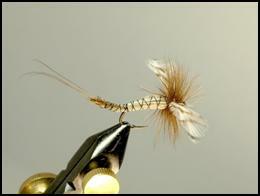 Body: Light Tan Deer Hair, tied parallel to the hook shank and flared at the tail. Body should be tied slender. This is Clarence Roberts' most famous fly. He originated this pattern between 1957 and 1959. It was created for his friend, George Griffith, who lost sight in one eye in an accident while fishing with Clarence. He created the fly so that George would have an easier time seeing a fly on the water. The fly in the photograph was tied by Clarence Roberts. The recipe above is the original pattern. Over the years many tyers have made slight adjustments to the pattern. Sometimes calftail is used for the post. Sometimes moose body hair is used for the tail and sometimes brown hackle is used instead of the original ginger. Thread colors are changed so that the pattern can be used for other hatches. The pattern is now tied in sizes as small as #22 and as large as a #2. 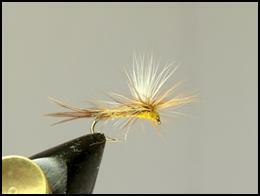 In smaller sizes the Yellow Drake works well for sulfurs or pale evening duns and in larger sizes for brown drakes. In sizes 6-8 XL it is considered the very best fly for the Hexagenia hatch. During heavy hex hatches the fly is tied in a size #2-4. When the Yellow Drake is tied in sizes larger than a #8 the body is tied thicker, with brown hackle and a clump of pheasant fibers for the tail with a thread size of 3/0. In the larger sizes (#2-6) the fly is referred to as the 'Hatching Caddis,' instead of the Roberts' Yellow Drake. The fly goes by many other names: Yellow Drake, Roberts' Drake, Golden Drake, Au Sable Hex, the Au Sable Parachute Hex and the Golden Drake Parachute. A Roberts' Yellow Drake fly, tied by Clarence is on display at the DNR Ralph A. MacMullen Conference Center at Roscommon, Michigan. Wing: Badger Hackle Tips tied spent. This pattern is another Clarence Roberts originals. It is however one of his lesser known flies. The fly was probably developed as a attractor or searching pattern. Hook: Mustad #94831 2XL Size: 6-10. 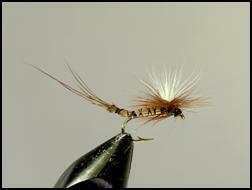 Tail: Pheasant Tail Fibers, small clump. Body: Yellow Wool tied with loop (egg sac). Rib: Brown Hackle, palmered heavy. Wing: Grizzly Hackle Tips, paired, tied spent. 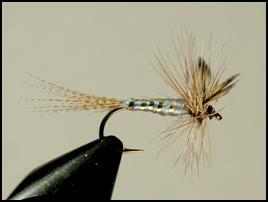 Clarence originated this fly to be used for the golden drake hatch and the big golden stone hatch. 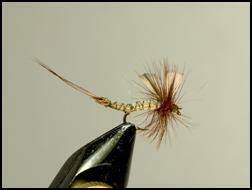 This fly is also called the Yellow Caddis or the Palmered Tied Yellow Caddis. The fly in this photograph was tied by Clarence Roberts. This pattern, tied by Clarence is on display at the DNR Ralph A. MacMullen Conference Center in Roscommon, Michigan. A special thanks to Clarence's son, Mike Roberts, who allowed me to disassemble his mounted display so that I might better photograph his father's flies. A thank you is also due to the Ralph A. MacMullen Conference Center for putting up with my many visits to better study the display of Clarence Roberts' flies.